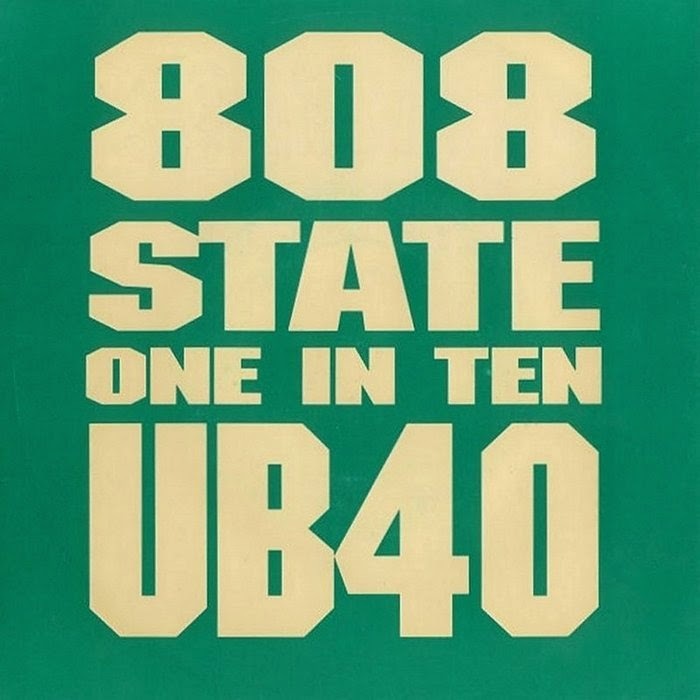 808 State Create Proto Mash Up With Remix of UB40's "One In Ten"
If you were alive in the early 90's then you are acutely familiar with the dawn of the techno music era. And by techno, I mean the proliferation of sub-genres (house, rave, trance, HI-NRG, etc) that featured break beats married to synth sounds and samples to create songs that served as the soundtrack to Ecstasy-fueled dance club culture that swept across the UK and the U.S. Quite a few of these songs crossed over becoming hits on pop radio or regular rotation on MTV here in the U.S. Among the notables were The Shamen (Move Any Mountain), Snap! (The Power), Black Box (Strike It Up) and Stereo MC's (Connected). The din and cacophony of all these dance beats finally caught my attention, when I heard an odd and very unusual, but inspired electronic version of UB40's "One In Ten" (though I was a fan of the 80's Acid Ska movement). The song featured elements of the band's classic as re-imagined by techno/rave collective 808 State. The track was a hit reaching #17 on the UK charts in late 1992, providing UB40 with an unexpected trip back into the charts. The pairing was eerily timely as unemployment figures in the UK in 1992 were around the same 10% mark as they had been when the original was released in 1981. Taking their name from the Roland TR-808 drum machine, 808 State were formed in Manchester in 1988 by Graham Massey, Martin Price and Gerald Simpson. Over the course of their career, they revolutionized the sound of dance, trance, rave and electronic music and collaborated with many music pioneers including members of New Order, Echo & The Bunnymen, David Bowie, Bjork and more. The remix kicks off with a flanged drum intro that switches from half to double time with a deep analogue sub-bass that sounds like a cross between Kraftwerk's "The Model" and Asward's "Love Fire" and seamlessly blends into the vocal chorus, organ, percussion and saxophone from the original. This is how a remix of an old classic should be done; using contemporary tools to modernise the sound without losing any of the original spirit of the song. So how did this unlikely pairing come about? According to an interview that members of 808 State gave in late 1992, "UB40 loaned us the original multitrack and we've used mainly the vocal and sax parts. There was no timecode or sync, not even a click, and the tempo wanders quite radically — getting a good loop out of it took ages. The original was around 132bpm and now it's 140. We made sure we dumped separate tracks and sub mixes of the vocals to DAT so that we would have various options for later re-mixes." Whatever your feelings about the track (I'm a fan), it may be one of the more popular and early examples of a mash up (a song or composition created by blending two or more pre-recorded songs, usually by overlaying the vocal track of one song seamlessly over the instrumental track of another) and served as an early prototype of drum and bass which went mainstream a few years later. The Specials Announce Limited Edition 7″ Vinyl Release for Record Store Day! 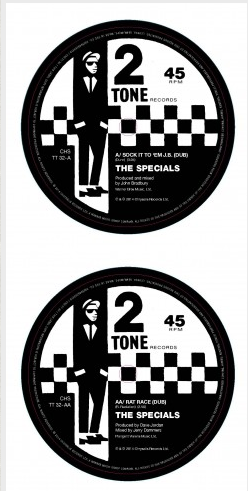 The Specials have dug deep into the 2-Tone vault and pulled out a treat! The band will be releasing a limited edition 7" single featuring two previously unreleased dub mixes created at the time of the ‘More Specials’ mixing sessions in 1980 by John ‘Brad’ Bradbury (Sock It To ‘Em, JB) and Jerry Dammers (Rat Race). The single will be pressed on the 2-Tone label imprint and will be available around the world in time for Record Store Day on April 19th. 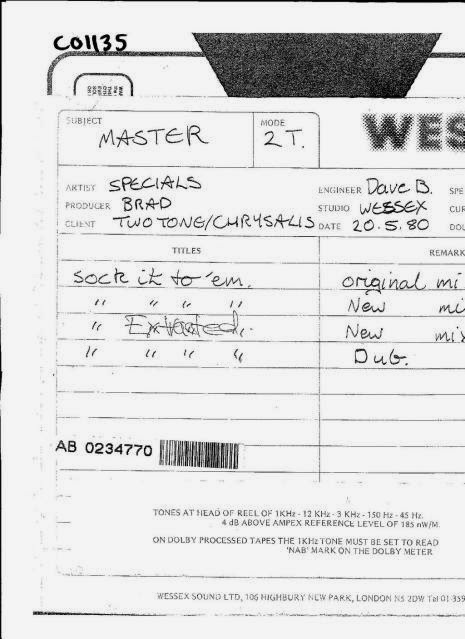 A year or so ago, Bradbury posted a picture on his Twitter page of the original mastering label from the "Sock It To 'Em, JB" recording session at Wessex Studios on May 20, 1980. In case you didn't know, "Sock It To 'Em, JB" is a cover of the Rex Garvin & The Mighty Cravers northern soul classic. And here is The Specials version from a live show here in New York in 1980. 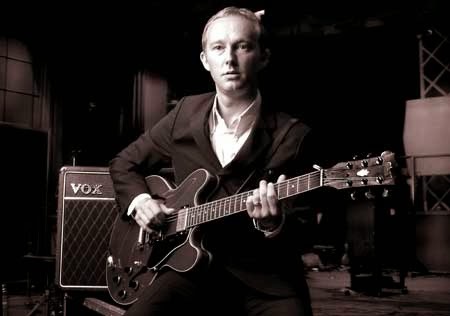 Steve Cradock, lead guitarist and founding member of Ocean Colour Scene and a member of Paul Weller's backing band, may be joining The Specials for their November UK tour. Cradock would replace Roddy ‘Radiation’ Byers as lead guitarist, who announced last month he was leaving the band to concentrate on his own band The Skabilly Rebels. While there has been no official announcement from the band, Byers may have pre-empted the band announcement with a post on his Facebook page yesterday wishing Cradock luck "...in his new job working for Mr. Hall." Cradock has posted fliers for the band's November tour on his Twitter feed, which would seem to confirm the news and the Torquay Herald Express posted a story about Cradock joining the band. Until the band announces it, let's consider this one an open secret! Below are videos of Ocean Colour Scene's mid-90's UK hits "The Day We Caught The Train" and "The Riverboat Song" as well as live video of Cradock performing with Weller. Below is video of Cradock performing "Liza Radley" with Weller. 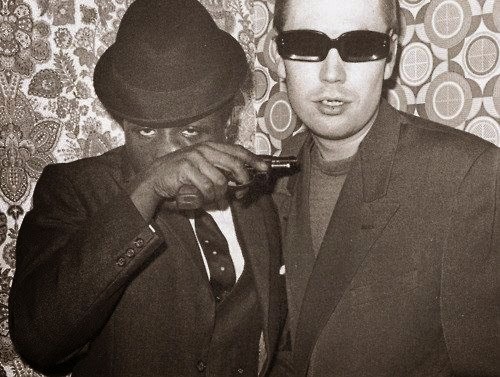 Jerry Dammers made a rare live appearance during a sold out set by Neville Staple and his band in London last night. Dammers was recognized by a member of Staple's band and was called up on stage to perform on a raucous version of "Monkey Man" with Staple and his band much to the delight of the crowd. Staple announced he was leaving the re-united version of The Specials in late 2012. He has been touring the UK with his own band ever since. Guitarist Roddy "Radiation" Byers announced he was leaving the band in February. As a bass player I always listen to the drummer. I can't help it! 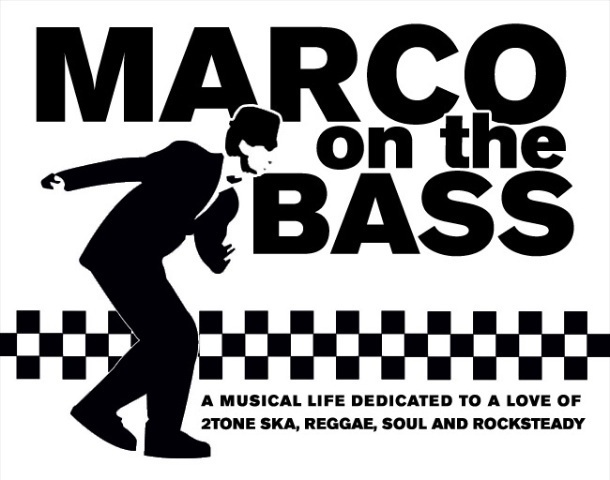 As a 2-Tone devotee, I was influenced by some of the best drum and bass combos including Horace Panter and John Bradbury of The Specials and Mark Bedford and Daniel Woodgate of Madness. 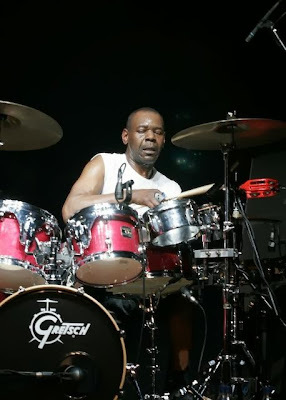 That said, I want to pay my respects to the unique talent of the The Beat's drummer Everett Morton. He and band bassist David Steele have influenced my bass playing and approach to music more than any other musicians. While The Beat has often been defined by its front men Dave Wakeling and Ranking Roger, as a bass player I have always focused on the way Morton and Steele were the engine of the band, creating uniquely new rhythm patterns -- witness "Mirror In The Bathroom" and "Twist & Crawl" -- that have stood the test time. When you hear those songs, you immediately know you are listening to The Beat. I think its fair to say that the timeless quality of The Beat's sound is defined by Morton's distinctive drumming style that includes syncopation and polyrhythm within a rock beat. He plays the entire kit percussively versus the familiar kick drum/snare/hi-hat style favored by others, employing rim shots where you would normally expect to hear the snare drum. Influential to many (just listen to Stewart Copeland of The Police, among others), Morton should be a household name. The uniqueness of The Beat's sound may have been a happy accident, having much to do with how differently Morton and Steele approached their instruments. According to Wakeling: "David Steele was a punk with a clear idea of what he wanted and where he was going. Everett Morton was a left-handed drummer; he had his kit set up like a right-handed drummer but played it left-handed. His was an original style and if you worked with it, it sounded real unique." Morton immigrated to England from St. Kitts in the mid-sixties, working in a kettle spinning factory and playing music in the evenings and weekends. He first learned the drums when his cousin asked him to join his band. After a stint at drum school in Birmingham, followed by practicing almost constantly on the furniture in his house, Morton developed his own style and began playing out around the Midlands. Morton joined Wakeling, Steel and Andy Cox at the urging of a friend who worked with Steele at a psychiatric hospital in Birmingham. At first it was rough going for the four band members. Morton was a reggae drummer, but the other three did not have experience playing the genre. While they listened to reggae frequently, they had up until that point been playing in a punk style. This was the beginning of the band's marriage of punk and reggae. These early days yielded the band signature hit "Tears Of A Clown." Check out Morton performing the song live during the 1983 US Festival. Although The Beat relied on Jamaican rhythms and other island rhythm and blues techniques, thanks to Steele, they differed from other ska revivalists by raising the intensity of their music with punk. Rolling Stone magazine described the band's first album "I Just Can't Stop It" as "a rambunctious cluster of singles held together by tenor saxophonist Saxa's winning, authoritative blowing and a rhythm section ... that cared more about adventure than duplicating antique reggae." As such, The Beat's best songs often had pumping, four-on-the-floor foundations with intricate, offbeat stick work, and Steele's intricate and patterned frenetic bass lines would lock in very tightly while the drums would shift, sway and move. Have a listen to "Twist & Crawl" as an example. Aside from the introduction, the song is based on two short verses, a longer verse, and a solo. These four sections repeat once, and then again with the song ending on a variation of the longer verse. Although considered a ska song, its really based on the rocksteady reggae that Morton heard as a youth in the West Indies. The hi-hat plays straight eighth notes with a quarter note accent while the kick pedal plays quarter notes and the rim shots plays on the three, with a second rim shot on the four. Listen to any song from The Beat's catalog and chances are that Morton's drums are key to what makes them memorable. Fans of the band who live in the U.K. are still lucky enough to still see Morton perform with Ranking Roger's version of the band. 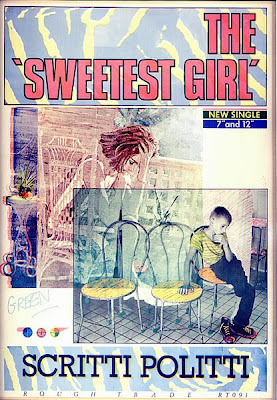 The Story Behind Scritti Politti's Mysterious Lover's Rock Hit "The Sweetest Girl"
The convergence of punk and reggae and punk and ska in the late 70's and early 80's resulted in some significant musical experiments in which punks and post-punk bands experimented with the sound of reggae and dub in particular: Most of the key 2-Tone bands played covers of 60's ska songs. The Clash played reggae covers and collaborated with Mikey Dread. The Slits worked with reggae producer Dennis Bovell (who invented Lovers Rock) and The Ruts recorded the reggae song "Jah War" releasing it on UK reggae band Misty In Roots record label. If you've never heard the song, it begins with the hiss and whisper of a drum machine, and then the bubble of lilting reggae keyboards - played by Robert Wyatt - and bass bring it to life as Gartside's croon kicks in. The result is white boy lover's rock that descends into dub as Wyatt's organ notes begin to ripple and dub echoes ricochet through the mix. What's the song about? That remains a mystery. At first it appears to be tribute to a sweet couple before Green goes off on a subversive tangent and sings one of pop music's most unusual couplets: "Politics is pride too, vagaries of science/ She left because she understood the value of defiance." Released on the Rough Trade label, "Sweetest Girl" became Scritti Politti's first song to chart, peaking at #64 on the UK music chart, and was cited by The New York Times as one of the ten best singles of 1981. Madness recorded their own version of the song for their 1985 "Mad Not Mad" album.